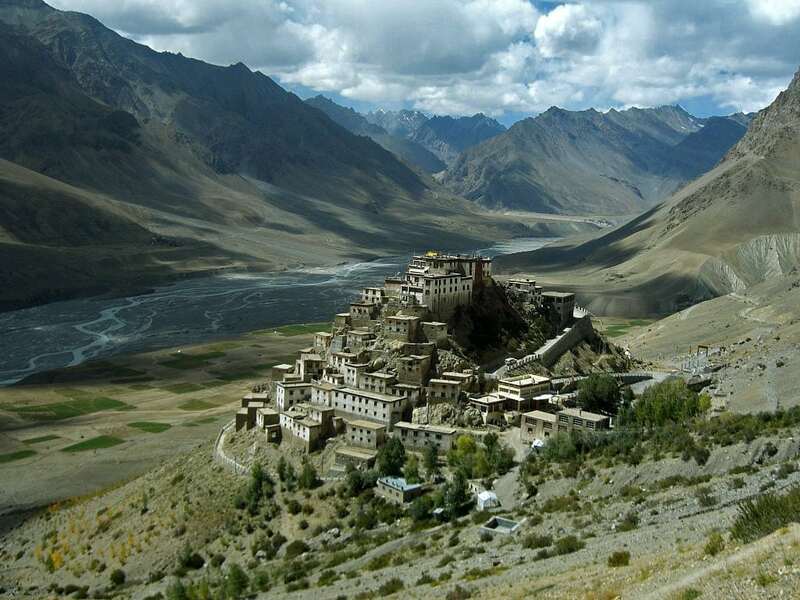 India hosts nearly immense wealth of ancient rock-cut architecture for diverse tastes. But many eyewitnesses agree that the most impressive chaitya – Buddhist prayer hall – is located in Karla Caves. The rock-cut temple chambers north of the present day Karla town belong to oldest cave temples of India. These amazing caves were started by ancient Buddhists more than 2,000 years ago: carbon-14 dating, inscriptions and architecture style indicate that the oldest cave here has been created sometime around 120 BC, during the Satavahana dynasty. In these times ancient trade route was leading from the Arabian sea into the Deccan, along Lenauli – present day Lonavali, located between South and North India. Buddhists in these times were known as successful traders and manufacturers and along the trade routes there appeared their temples. Karla Caves – entrance, partly obtruded by contemporary Hindu temple / en.wikipedia.org, Sid iima. Early Buddhist temples were located in natural areas – away from cities to avoid the distraction of the material world but not too far from inhabited places – to keep contact with people. These temples provided lodging for traveling traders, serving as important location for rest, safety, exchange of information and even – as early banks. Temples carved in natural cliff were especially well suited for Indian conditions and prescriptions of Buddhists – they were cool in summer, pleasant in winter and spiritually were part of nature. It is believed that in the 2nd century BC – mid 2nd century AD there were carved thousands of caves in Sahyadri Hills (Western Ghats) for all Buddhist communities. 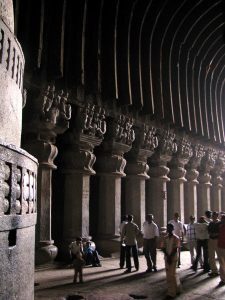 Part of Karla Caves have been created later – in the 5th – 10th centuries AD. First sacred Karla Cave was natural cave but soon there followed man-made caves. The rugged, coarse trapp is far from being the easiest material to work with, but ancient Indians proved that determination and acuteness work wonders. Such work was not done by self-denying and enlightened Buddhist monks – just like today, it was performed by well-organised teams of professionals and most often paid by authorities. 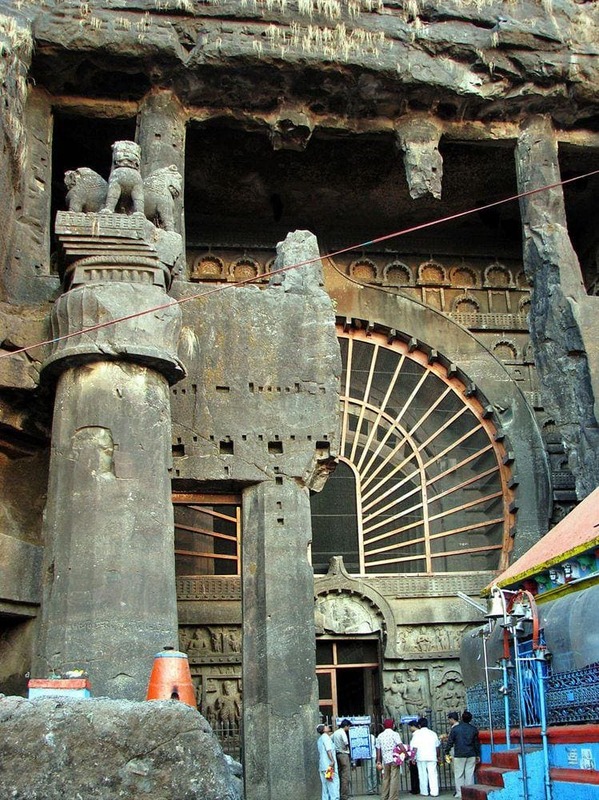 Karla Caves were built in especially hard circumstances – in the difficult terrain of a rocky hillside. Such caves were built from the top downwards. Initially, the hillside was cleared of vegetation and debris. Then there was made a pair of tunnels inside the rock up to the desired depth. Timber wedges were driven vertically in the rock and moistened. As the wood expanded, the cliff was fractured, forming large chunks of rock. This rock was carefully removed and the exposed walls of cave chamber leveled and polished. After the main body of rock was removed, more exquisite sculpting was done. Temple builders did unbelievably magnificent and sophisticated work – leaving columns and other structural elements at exact distances and proportions and carving some of the most beautiful ancient sculptures of the world in situ. Hundreds of sculptures. Karla Caves represent the highest achievement of Indian rock-cut architecture of the time and are one of the earliest examples of ornate and richly decorated rock-cut temples in India. In splendour these caves can be compared to Ajanta and Ellora but are much less popular – thus visit here is pleasant due to less crowds. Part of the caves is accessible by climbing 350 steps cut in the rock at the time when temples were built – tourists often are without breath after this hefty climb. Construction workers moved here not only themselves but many tons of stones – doing it carefully, without damaging the exquisite carvings and leveled surfaces. The earlier caves were made by the more ancient branch of Buddhists – Theravada Buddhists. Back then images of Buddha were not used in temple architecture. 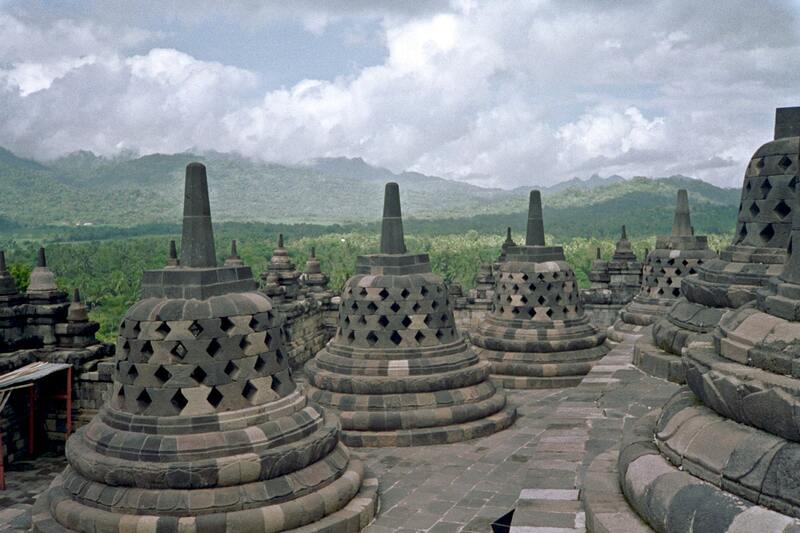 Later – Mahayana Buddhist temples from the 5th to 10th century – include statues of Buddha. The architecture of earlier cave temples in many respects repeats the elements and construction of wooden architecture. According to their use Indian Buddhist cave temples can be divided in chaityas – sanctuaries and viharas – a kind of monasteries. Chaityas – halls used for congregational worship, had more exquisite architecture. Viharas often were lavishly adorned as well, they contained austere cells cut into walls of the central hall – here lived monks. 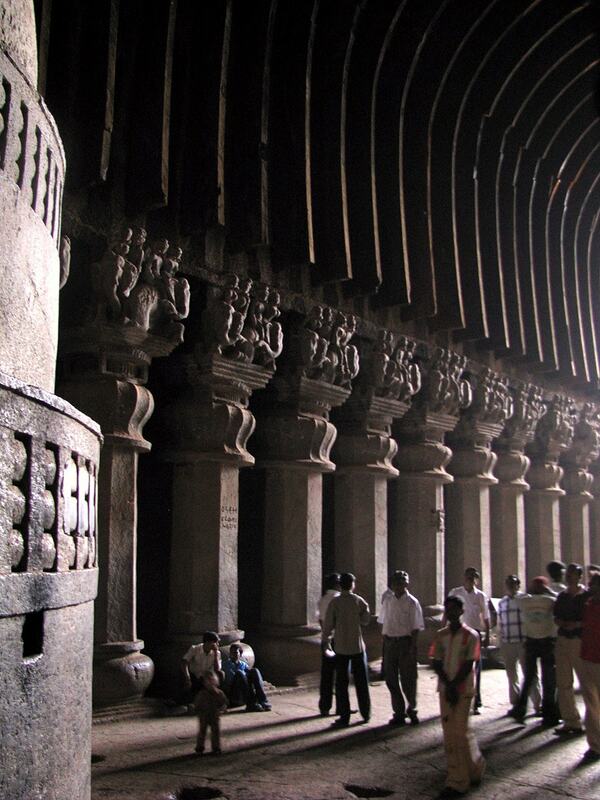 Karla Caves are characterized by a large horseshoe-shaped windows lighting the interiors and vaulted interiors. Sculptures of Karla mark new tendencies in Indian art – more plasticity, figures are approximately 60% free of the wall behind them. Sculptures are refined, with folds of clothing, earrings etc. The architectural and artistic achievements made in Karla Caves have left a profound impact on the development of Indian art. Caves contain enormous chaitya – the largest and possibly the most beautiful among the more than 1,000 cave temples in India, carved in the 1st century BC. Sometimes this cave temple is considered to be the highest achievement of Indian cave architecture. 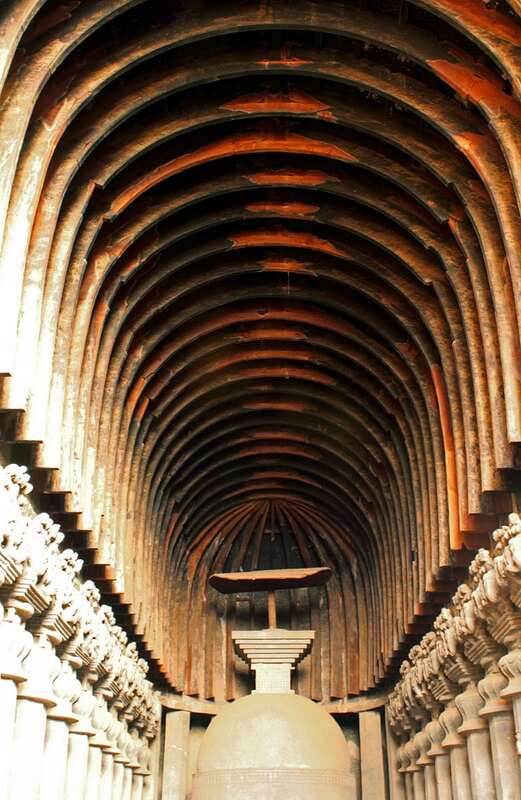 This 45 m long and up to 14 m high chaitya has beautiful façade with numerous sculptures in both sides of the central doorway and rich, intricate artwork and structural elements inside, often imitating woodwork. The stone carvings depict people, lions, and elephants – and it is believed that sculptures of elephants in the central hall originally had tusks of genuine ivory. Frequent element is mithuna – women and man in pairs. Walls originally were covered with murals. Important role is played also by the light coming in through the large window – the softened sunlight adds a different flavor to exquisite sculptures and architectural details. 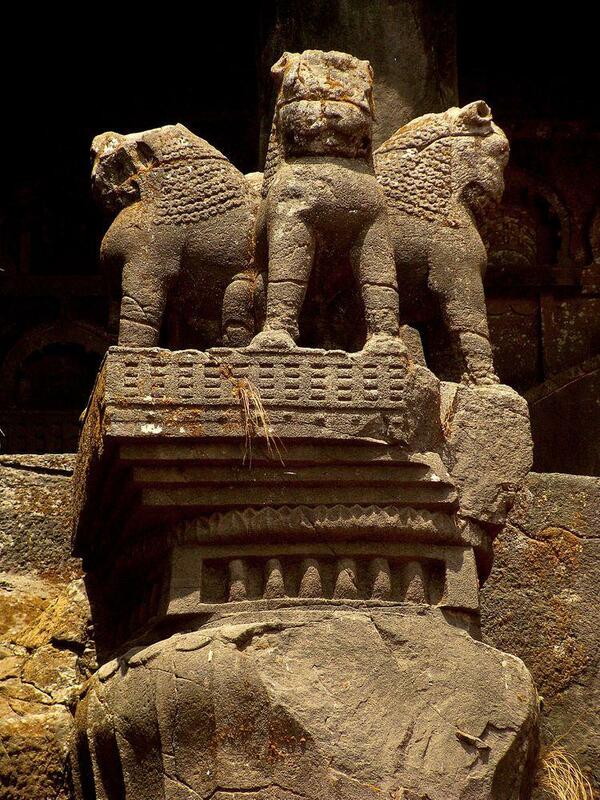 At the entrance of this chaithya stands 15 m high pillar with exquisite capital adorned with lions. Earlier there was one more pillar. The site of this another pillar nowadays is taken by a temple of another religion – it is devoted to Hindu goddess Ekveera and visited by thousands of pilgrims every year. Often this temple and pilgrimage is seen as an encroachment of Hindu religion on Buddhist shrine. Rows of pillars divide the chaitya into three parts – central hall and narrow side aisles, divided by two rows of ornate pillars – 15 pillars in each row. Pillars have beautiful capitals, which, among others, include also a representation of man and women riding elephants and bowing to Buddha. Representations of Buddha have been added around the 7th century AD. Contrary to some other cave temples, the ceiling in Karla Cave No. 12 has wooden ribs and not stone ribs. This woodwork (chhatri) is unique – wood has been cut 2,000 years ago and has been preserved rather well, without signs of corrosion. Far end of chaitya contains the shrine – stupa with an umbrella over it. Indian-Visit.com, Karla Caves, accessed in 30 March 2010. Travelmasti.com, Karla Caves, accessed in 30 March 2010. Asian Art and Architecture: Art & Design 382/582. Lecture 7. Later Andhra Period India, accessed in 30 March 2010. 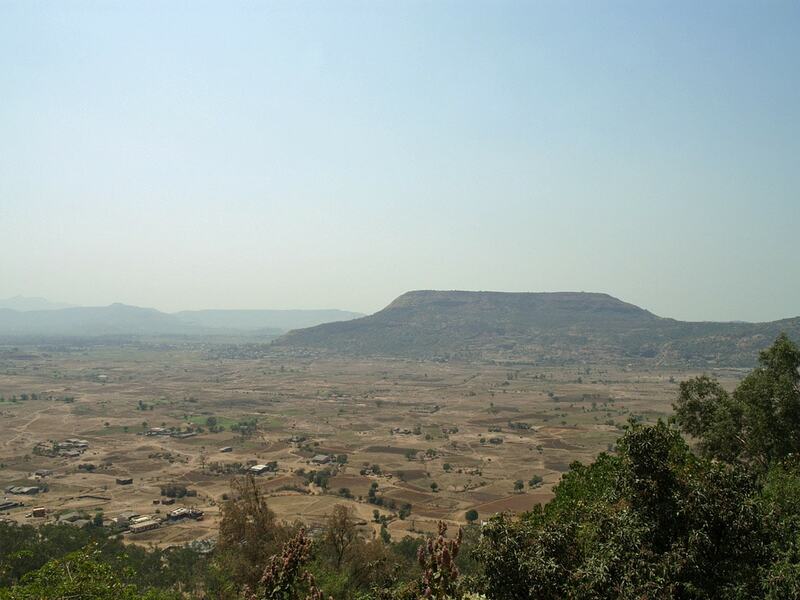 Sudhir.in, Cave: Karla-Lonavala, Pune, Maharashtra, accessed in 31 March 2010.